Zimbabweans are in widespread despair after the country’s ruler Robert Mugabe was sworn in as president for a sixth term, a Catholic Church official has said. In rural areas of the country, the June 27 runoff election, in which Mugabe was the only candidate, “was masterminded by thugs” loyal to the ruling party, said Alouis Chaumba, who heads the Catholic Commission for Justice and Peace in Zimbabwe. Mugabe was sworn in on June 29. While many people in Zimbabwe’s cities did not turn up at the polling stations, people in rural areas “were warned that they had to go and vote,” he said. “They were not allowed into the booths on their own but were made to tell the electoral officers that they were unable to read or write and then were given folded ballots (for Mugabe) to hand in,” he said. In high-density hostels in Harare, the capital, people were told they would be evicted if they did not vote, he said. Opposition leader Morgan Tsvangirai, who withdrew from the runoff election because of the violence, won the most votes in the first round of presidential voting in March but not enough for an outright victory. Human rights groups said opposition supporters have been the targets of brutal state-sponsored violence since March, leaving more than 80 dead and 200,000 displaced. Zimbabwe’s electoral commission reported more than 2 million votes cast for Mugabe, and 233,000 for Tsvangirai, whose name was still on the ballot although he withdrew from the election on June 22. The government reported the turnout at about 42 per cent, with about 131,000 spolied ballots. Bishop Kevin Dowling of Rustenburg, South Africa, said he hopes governments in the African Union “have the courage of their convictions to speak out against Mugabe” at the June 30-July 1 summit of the 53-nation bloc in Egypt. Mugabe is attending the meeting. Zimbabwe’s Jesuits said Mugabe’s campaign claim that “only God can remove me from power” is outrageous. 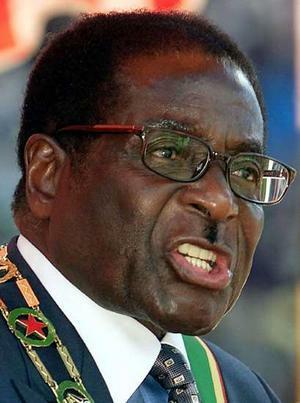 “In making such an outrageous claim, Mugabe, who likes to be known as ‘a devout Catholic’ goes completely against the teaching of the Catholic Church and the Church’s positive attitude toward democracy,” the Jesuits said. This entry was posted in Crime & Corruption, Police State Dictatorship. Bookmark the permalink. Can’t they use him for microwave crowd control testing or something? But if the NWO was with it–they’d clone him for the next generation cyber enhanced mutant army. Hopefully somebody’s holding a bullet with Mugabe’s name on it. He’s just another mini-Hitler conceived and maintained by the Jesuits (Jesuit trained) and the neofeudal masonic aristocracy (Order of the Bath). He is a just a tool of the usual Order Out of Chaos program. When they are done with him, he could be disposed of like many puppet dictators are (Ceausescu was Order of Bath too remember and probably Jesuit trained like Stalin), or he will be given a new identity to live out his retirement in luxuary on some British controlled island somewhere.